With the aim to establish and understand morphological changes in response to stream restoration measures, a detailed monitoring plan was implemented in a lowland stream called Lunterse Beek, located in the Netherlands. Over a period of 1.5 years, the monitoring included serial morphological surveys, continuous discharge and water level measurements and riparian vegetation mapping. Morphological processes occurred mainly in the initial period, before riparian vegetation development. In the subsequent period, riparian vegetation started to emerge, with a maximum coverage halfway the survey period, which coincides with the end of the summer period. Detailed morphological and hydrological data show a marked difference in behaviour between the unvegetated initial stage and the vegetated final period. The riparian vegetation cover, obtained from an aerial photo, shows a strong correlation with inundation frequency. We applied linear regression to relate morphological activity to time-averaged bed shear stress. In the initial stage after construction, with negligible riparian vegetation, channel morphology adjusted without a clear response to the discharge hydrograph. In the subsequent period, morphological activity in the channel bed and bank zones showed a clear response to discharge variation. 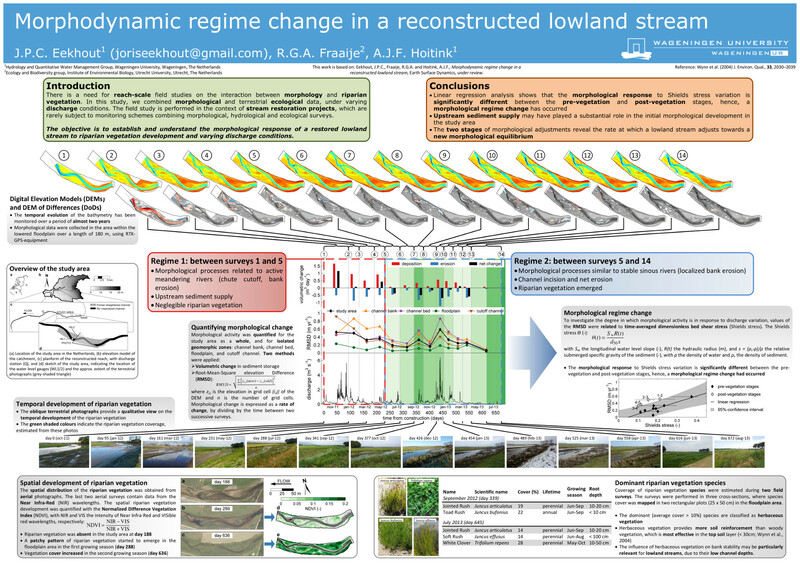 The two stages of morphological response to the restoration measures reveal the role of riparian vegetation, which acts to focus the morphodynamic developments in the main channel.